Percy Perkins was the verger and lived in the verger's house in Church Street, opposite the Woodman's Stroke Public House, but is now in private ownership. Harry Boyer was the proprietor of the bus company having established the first public bus service in the midlands. He was a great benefactor to the church, every year financially providing for the choir members to attend a performance of the pantomime at the Leicester Opera House. He also financially supported the annual outing of the choir boys. A grand affair going on such trips as London with a river journey to Windsor including dinner en route. A rarity in those days. 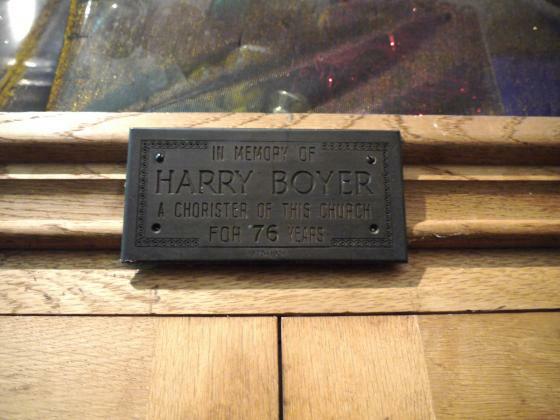 A plaque in the main entrance porch to Rothley Parish Church. Tom Hickling was another carpenter/joiner who, together with his brother Ted, had a woodwork and undertaking business at the rear of the Woodman's Stroke in Church Street, Rothley. Hubert Sleath was a member of the building family in the village and trained as a carpenter/joiner. He was for many years the people's church warden. The Rev. Charles Becher was a member of a wealthy Bourton-on-the-Water family who disappointed them after graduating at Clare College, Cambridge, by entering the church and breaking a family tradition of the eldest son joining the army. During the Second World War his brother became aide de camp to General Montgomery. Charles, together with his wife, became missionaries in China where his daughter Mary was born. Upon his return to this country he ran a Boys Club in Kent before arriving in Rothley as vicar in 1938. Aubrey Bland was undoubtedly the finest organist/choirmaster the parish has ever experienced. He developed the choir into one of supreme quality. A choral Matins and Evensong, including an anthem, every Sunday plus a choral Communion every month. The photograph that this narrative relates to was taken early in 1939 to mark his departure to Canada to become organist/choirmaster at a Roman Catholic Cathedral. Cecil Gee was for many years the Vicar's Warden and, like Hubert Sleath, has a special pew marked by his staff of office which was carried during processions and on special occasions. He lived on The Ridgeway and was the Chairman of Stead and Simpson Board of Directors. George Coltman had a carpenter and wheelwright business on the Mountsorrel Lane and had been a choir member for many years. Syd Brewin was the proprietor of the village cycle shop in Woodgate, Rothley, now the Rothley Pharmacy. In addition to his vending of cycles and their accessories he also recharged radio accumulator batteries. There was no mains electricity at the time! Ted Hickling was the brother of Tom featured above and was a partner with him in the carpentry business.